KONGOS, a multi-cultural rock/pop band which consists of four brothers (whose last name is Kongos) with roots in South Africa, the U.K. and the U.S., has become a fast-rising group both in the U.S. and internationally. Their breakthrough single “Come With Me Now’ is one of the few rock songs to have a major impact on the pop charts during the past year. In addition, the band has signed with Epic Records and their album Lunatic has been a success in the U.S., South Africa and Europe. 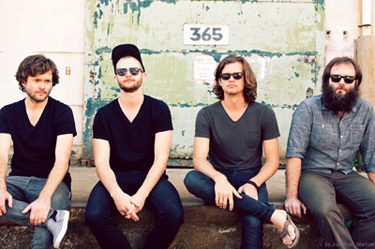 All four brothers in KONGOS play multiple instruments, sing, and write songs. The group consists of Jesse Kongos (vocals, drums, percussion), Johnny Kongos (keyboard, accordion, vocals), Dylan Kongos (bass, lap slide guitar, vocals) and Danny Kongos (guitar, vocals). Notably, the brothers also produce, engineer and master their own recordings, and they film their own music videos. The four brothers were inspired by their father John Kongos, who was a popular singer/songwriter in South Africa and the U.K. in the 1970s. They spent their early childhood in both Johannesburg and London, before settling in Phoenix, AZ in the mid-’90s. They were uniquely exposed to a wide range of musical genres, from South African music to rock, pop and jazz. The band released independently their self-titled debut album in 2007, and built a following via steady touring. It was in 2012 when things really picked up, when KONGOS released independently their second album Lunatic, which received substantial radio airplay in South Africa with the singles “I’m Only Joking” and “Come With Me Now.” It was the latter song which received the greatest exposure and helped the band secure a major label deal with Epic Records, which re-released the Lunatic album in February 2014. The single “Come With Me Now” has since been certified platinum in the U.S., and achieved success on the Billboard pop, alternative and rock charts. The popularity of the song has also led to many placements in movies, TV shows and commercials. During much of 2014, the band continued to tour and played shows in several countries, and opened for such top bands as Kings of Leon, OneRepublic, Alice In Chains and Linkin Park. Currently (Jan. 2015), KONGOS is about to launch a North American headlining tour, starting in Dallas, TX, and hitting many other cities including New York, Boston, Philadelphia, Toronto, Montreal, Nashville, Denver, San Francisco and Los Angeles. We are pleased to do this Q&A interview with Jesse Kongos of KONGOS. He tells how the band got started, how they signed with Epic Records, and he discusses their songwriting process. DK: Is it true that you got your first break by sending an email with an mp3 of “I’m Only Joking” to radio stations in South Africa? Jesse Kongos: Yeah, we sent a few songs to South African radio stations as well as local Phoenix stations. Around about the same time, Beef Vegan at KWSS in Phoenix and 5FM in South Africa decided to start playing “I’m Only Joking” and almost overnight we started to get a huge response. This encouraged us to finish Lunatic and go tour in South Africa. It was the first region to really take off for us. We built a good following in Phoenix, but it took almost two years from that point to get noticed in the rest of the U.S.
DK: You originally released your Lunatic album independently. How did you sign with Epic Records? Jesse Kongos: We first released Lunatic through an independent label in South Africa called Just Music and a few months later we self-released for the “rest of the world.” It wasn’t until late 2013 when we decided to test the radio waters ourselves with the help of our management company. Denver and Chicago both started playing “Come With Me Now” and “I’m Only Joking” respectively. It was at this point that the labels started to take notice. Someone from our management played the “Come With Me Now” video to L.A. Reid (CEO of Epic Records) and he apparently responded very enthusiastically. Epic made a much stronger offer than any other label and it seemed like the right fit. We always prefer to work with people who share a real enthusiasm for the music. DK: I read that it was Johnny (Kongos) who wrote “Come With Me Now.” How did he write this song? Did you know early on it would be the band’s breakthrough song? Jesse Kongos: Yeah, he made a demo and it had this very strong Kwaito feel and an accordion riff. We knew right away that it had commercial potential and it felt like a hit, but given how long it took to get noticed we started to question our judgment haha. When it finally sparked, we were relieved to know that we weren’t crazy… at least not for those reasons! DK: I noticed on your album credits that each member wrote songs on the album. Do you each prefer to write songs on your own, rather than co-write? Jesse Kongos: Yeah, we’ve found in general that we prefer to write alone. It can be a very personal process, so it seems to work better for us this way. When we get to recording and playing a song live, the process becomes very collaborative. Not ruling out co-writing for the future though. DK: I really like your new single “I Want To Know.” What inspired you to write this song? Jesse Kongos: Thank you! I felt a bit at a loss because of how much difficulty we were having getting traction with the band and the phrase “what’s it gonna take” came to mind. I had the chord sequence forever, but hadn’t known what to do with it. So the song started to come together with that phrase beginning the lyric, even though that’s not really what the lyric is about… it gave me a starting point. I love Bob Marley and some other reggae type stuff like Manu Chao and wanted infuse some of that into our sound. DK: I read that you produce, engineer and master your own records and you film your own videos. How did the band members get so skilled at doing everything on your own? Jesse Kongos: So much of what we do has been out of necessity—for so long no one would sign us and hire people to do it for us haha. We were lucky enough to grow up with access to all kinds of instruments and recording equipment, so with our dad’s help we taught ourselves to make records. Some of us studied film and video in high school and it always interested us, so it was a natural progression. DK: Are you currently writing songs for a new album? Will you be releasing a new album in 2015? Jesse Kongos: We’ve already written a lot of songs for our next record and have been playing some of them live. We’re hoping to have time to get into the studio around April and aim for new music later this year.